The aim of this study was to evaluate the effect iveness of ilioinguinal neurectomy on postoperative pain in the Lichtenstein tension-free hernioplasty of inguinal hernia. Chronic pain following tension-free inguinal hernioplasty is a significant clinical problem that can interfere with normal daily activities. Moreover, the condition can sometimes be debilitating, and treatment is often difficult and challenging. Contrary to the previous belief, division of the ilioinguinal nerve prophylactically during mesh repair has been practiced to reduce the incidence and intensity of persistent postoperative pain after hernia repair. Between April 2015 and October 2016, this prospective, randomized, controlled study included 40 male patients above 18 years of age with unilateral inguinal hernia who were undergoing the Lichtenstein hernia repair. Patients were randomized into two groups – the ilioinguinal neurectomy group and the ilioinguinal nerve preservation group. Twenty patients were included in each group. Patients were followed-up for inguinal postoperative pain at 1 and 6 months using a four-point categorical scale. Groin numbness was also assessed at 1 and 6 months using a self-administered questionnaire. There were no statistically significant differences between the two groups with regard to postoperative pain after 1 and 6 months at rest; however, after coughing 10 times, walking up three flights of stairs, and cycling for 10 min, there were statistically significant differences – postoperative pain in group A was 5% and in group B 30% (P < 0.05). There were statistically significant differences with regard to postoperative groin numbness after 1 month – postoperative numbness in group A was 15% (P = 0.046). However, after 6 months, there were no significant differences between the two groups with regard to groin numbness (P = 0.156). Ilioinguinal neurectomy should be considered a routine surgical step during the Lichtenstein tension-free hernioplasty. Inguinal hernias are the most common abdominal wall hernias. They account for 80% of all hernias diagnosed . Approximately 96% of all groin hernias are inguinal hernias. Inguinal hernias occur in about 15% of adult men . Various techniques have been used for repairing inguinal hernias such as the Lotheissen, McVay, and Shouldice techniques, but a dramatic change appeared when Lichtenstein first introduced a mesh for tension-free reconstruction of hernial defects, which later became the gold standard . Chronic pain following inguinal hernia remains an important measure of clinical outcome that has been reported in 63% of inguinal hernia repair cases . Chronic groin pain can be classified into neuropathic and nociceptive (somatic) pain. Neuropathic pain occurs as a result of entrapment or direct nerve injury. Entrapment of one or more inguinal nerves can be caused by perineural fibrosis, suture material, staples, and mesh prosthetic material . Direct nerve damage can be caused by partial or complete transection of nerves due to accidental cutting, excessive traction of the nerves, or electrical coagulation . Nociceptive (somatic) pain is caused by mesh-related fibrosis, mechanical pressure caused by a folded mesh, gradual mesh displacement or contraction, damaged surrounding structures such as periosteal layers or musculotendinous tissues, or postoperative causes . Evidence concerning treatment options for chronic groin pain syndromes is limited. Nonsurgical treatment options including analgesics (e.g., NSAIDS, antidepressants, or anticonvulsants), peripheral nerve blocks with local anesthetics, transcutaneous electric nerve stimulation, laser therapy, pulsed radio frequency for chronic posthernioplasty pain have been used for a limited number of patients . Surgical treatment is based on the repair technique, subsequent reoperations, pain character, the presence of recurrence, meshoma, and the fixation material. Selective ilioinguinal, iliohypogastric, and genitofemoral neurolysis or neurectomy, removal of mesh, and revision of repair are common options of surgical treatment . Much controversy exists regarding the best management for the ilioinguinal nerve during hernia repair. Traditional surgical techniques dictate that the ilioinguinal nerve should be preserved at all times during repair because of the morbidity associated with cutaneous sensory loss and chronic groin pain following nerve injury. Elective division of the ilioinguinal nerve to reduce development of chronic posthernioplasty pain has been recommended by some workers. Recently reported randomized controlled trials have confirmed the benefits of neurectomy in chronic posthernioplasty pain . The aim of this study was to evaluate the effect of prophylactic ilioinguinal neurectomy on the incidence and severity of chronic groin pain following the Lichtenstein tension-free hernioplasty for inguinal hernia. After receiving approval from the appropriate ethics committee, this prospective, randomized study was conducted at Menoufia University Hospitals and Ras Elteen General Hospital between April 2015 and October 2016. Randomization was carried out as listed by randomization technique in Microsoft Excel Program (Excel Township, Marshall county, Minnesota, USA). Forty male patients with primary unilateral inguinal hernias were included in this study. All of them were above 18 years of age and were undergoing the Lichtenstein tension-free hernioplasty. Patients with recurrent hernias, irreducible or strangulated hernias, peripheral neuropathy, and previous abdominal surgery within the past 1 year were excluded. Informed consent was obtained from patients before the procedures. Each patient was subjected to full history taking, thorough clinical examination, laboratory investigations, and radiological investigation in the form of chest radiography. Type IV represents all recurrent hernia. All patients undergoing the Lichtenstein tension-free hernioplasty were randomly divided into two groups, and each group included 20 patients. In group B, the repair was performed and a polypropylene mesh measuring 7 × 15 cm was secured to the floor of the inguinal canal by 2/0 nylon stitches. The ilioinguinal nerve mentioned above was identified and preserved. Next, the external oblique fascia was closed above the spermatic cord. In group A, the whole ilioinguinal nerve was excised as far lateral to the deep ring as possible and medially to where it enters the rectus muscles. The cut ends were left free without implantation into muscle or ligation. A polypropylene mesh was placed as described. Assessment of pain immediately postoperatively was carried out using a numeric pain-rating scale, and the amount of analgesia required was recorded. Early postoperative complications such as wound infection, hematoma, retention of urine, chest infection, or deep vein thrombosis were recorded. 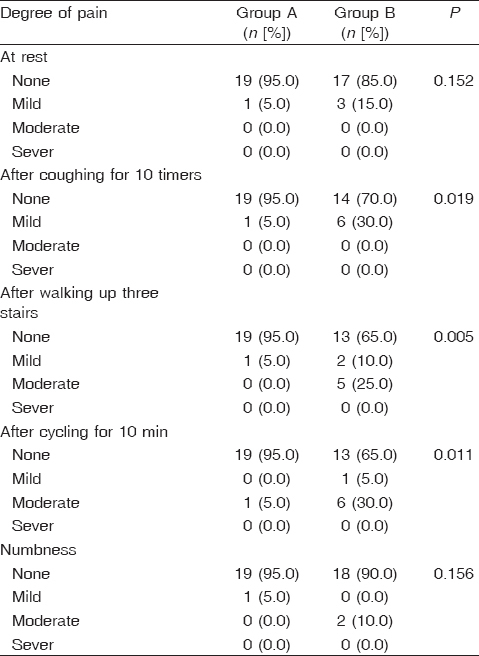 Follow-up for the presence or absence of pain at 1 and 6 months postoperatively at rest and upon completion of various activities (coughing 10 times, walking up three flights of stairs, and cycling for 10 min) was carried out using a four-point scale (none, mild, moderate, and severe). Numbness at the groin region was assessed postoperatively, documented by a self-administered questionnaire with a four-point scale (none, mild, moderate, and severe). Data were collected and entered into a personal computer. All statistical analyses were carried out using statistical package for the social sciences (SPSS, version 20) software. The arithmetic mean and SD for categorized parameters were calculated. The χ2-test was used for numerical data, and the t-test was used to compare between two groups. The level of significance was set at 0.05. The present study included 40 male patients who were randomly allocated into two groups with 20 patients each. Group A patients underwent ilioinguinal neurectomy, whereas group B patients had ilioinguinal nerve preservation. The patients were followed-up for 6 months after the operation. The age range of patients in group A was from 22 to 47 years with a mean of 34.7 ± 8.92 years, whereas it ranged from 19 to 50 years with a mean of 32.55 ± 9.52 in group B. There was no significant statistical difference between the two groups, as the P value was 0.233 [Table 1]. According to the Nyhus classification, it was found that in group A eight (40.0%) patients were type I, seven (35.0%) patients were type II, three (15.0%) patients were type IIIa, and two (10.0%) cases type IIIb, whereas in group B it was found that seven (35.0%) patients were type I, eight (40.0%) patients were type II, two (10.0%) patients were type IIIa, and three (15.0%) cases type IIIb. On comparing the two groups, it was found that there was no significant difference between the two groups, as the P value was 0.265 [Table 2]. The ilioinguinal nerve was identified and excised in group A, whereas it was identified and preserved in group B. In both groups, all patients had immediate postoperative pain (at 12 and 24 h). At 12 h, postoperative pain ranged from 2 to 7 on the numeric pain-rating scale in group A, whereas it ranged from 1 to 7 in group B. At 24 h, pain in both groups ranged from 0 to 6. At 7 days, pain ranged from 0 to 4 in group A, whereas it ranged from 0 to 3 in group B. 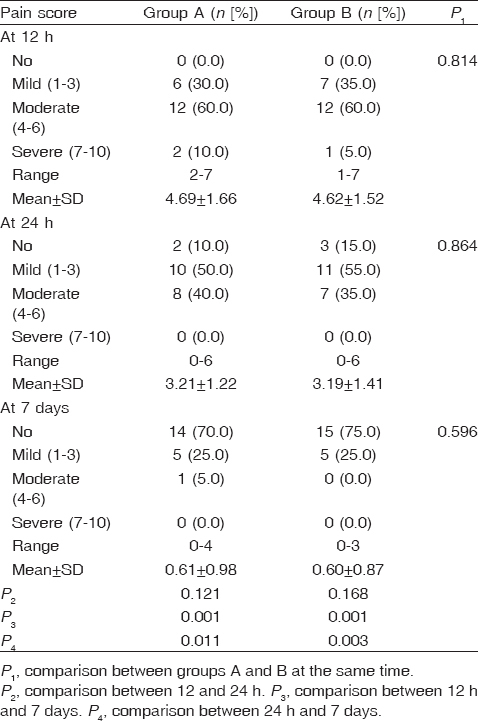 Pain at 7 days was significantly lower than at 12 and 24 h [Table 3]. At 12 h, in group A, 18 (90%) patients were relieved by regular analgesia consisting of NSAIDs only, and two (10%) patients needed opioid analgesia. In group B, 17 (85%) patients were relieved by regular analgesia, and three (15%) patients needed opioid analgesia. At 24 h, 16 (80%) patients needed regular analgesia in both groups, and only one patient needed opioid analgesia in group B. At 7 days, three (15%) patients in group A and two (10%) patients in group B needed regular analgesia. 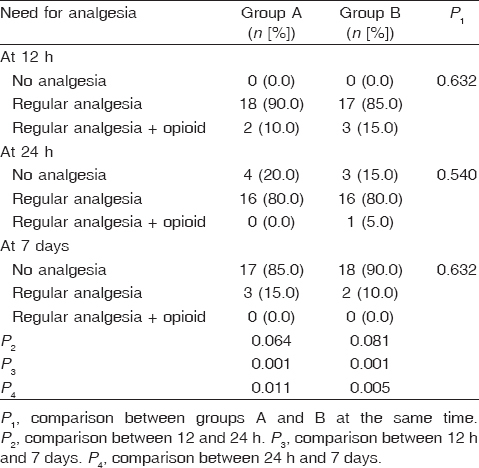 Analgesic needs at 7 days were significantly lower than that at 12 and 24 h [Table 4]. Two (10%) patients in both groups had superficial wound infection and received appropriate antibiotics. One (5%) patient each from both groups had hematoma. One (5%) patient in group B had retention of urine. There was no statistically significant difference regarding incidence of early postoperative complications in the two studied groups, with a P value was 0.246 [Table 5]. All patients in both groups were assessed with regard to postoperative pain and groin numbness after 1 month. There were no statistically significant differences between the two groups at rest (P = 0.369); however, after coughing 10 times, walking up three flights of stairs, and cycling for 10 min, there were statistically significant differences as postoperative pain in group A was 5% and in group B 30% (P < 0.05). Regarding sensory disturbance after 1 month postoperatively, there were statistically significant differences, as postoperative numbness was 15% in group A, with a P value of 0.046 [Table 6]. Follow-up of patients in both groups after 6 months showed that there were no statistically significant differences between the two groups with regard to postoperative pain after 6 months at rest (P = 0.152), but after coughing 10 times, walking up three flights of stairs, and cycling for 10 min, there were statistically significant differences, as postoperative pain in group A was 5% and in group B 30% (P < 0.05). Regarding sensory disturbance after 6 months postoperatively, there were no statistically significant differences, as the P value was 0.156 [Table 7]. In the present study, patients of both groups were comparable with respect to age. The mean age of patients in group A was 34.7 ± 8.92, and in group B it was 32.55 ± 9.52. In a study by Mui et al. , the age ranges were 65.1 ± 10.1 and 63.0 ± 16.3, respectively. The mean age of patients in a study by Alfieri et al. was 55 years, and in a study by Zanghi et al. it was 58 years. The mean age reported by Nienhuijs et al. was 57.5 years. Thus, inguinal hernia is a disease affecting all age groups. Prolonged straining and heavy lifting are mostly the causes in younger patients, whereas urinary problems comprise the chief etiology in older patients as a result of benign prostatic hyperplasia ,. Bittner et al. reported an overall risk of complications after inguinal hernia operations from 15 to 28%. The authors found that hematomas and seromas were the most frequent early complications. Schmedt et al. found a similar incidence of complications. However, Nordin et al. found a higher incidence of complications ranging from 17 to 50%. McCormack et al. reported that early complications included hematomas, seromas, urinary retention, and early pain, whereas late complications included chronic pain and recurrences. Life-threatening complications were rarely reported. Simons et al. stated that the risk for hematomas varies between 5.6 and 16%, whereas the risk of wound infection should be below 5%. In our study, the overall incidence of postoperative complications in the two groups was 20%. Superficial wound infection was the most frequent, found in 10% of cases in both group A and group B. Inguinal hematoma was the second most common complication; it was present in 5% of cases in both groups. In the study by Ravichandran et al. , the first to assess the effect of division of the ilioinguinal nerve in a randomized manner, they performed randomization in a patient with bilateral inguinal hernia (neurectomy on one side and preservation of the ilioinguinal nerve on the other side). No evidence was found to support the benefit of ilioinguinal nerve division with respect to postoperative pain. However, this study was limited by its small sample size as well as the short follow-up of 6 months. Ravichandran et al. did not compare between two groups, and also did not study chronic pain after various exercises as well as numbness along the ilioinguinal nerve distribution. In another retrospective study, Dittrick et al. included 156 patients who were randomly divided into two groups either with ilioinguinal nerve preservation or transection. They found that there were no statistically significant differences between the two groups with regard to groin pain after 1 month postoperatively. Dittrick et al. did not test groin numbness as well as groin pain after various activities. Our study was performed on 40 patients aged 18 years and older who had primary inguinal hernia, and were randomized into  groups – group A underwent ilioinguinal neurectomy and group B underwent ilioinguinal nerve preservation. 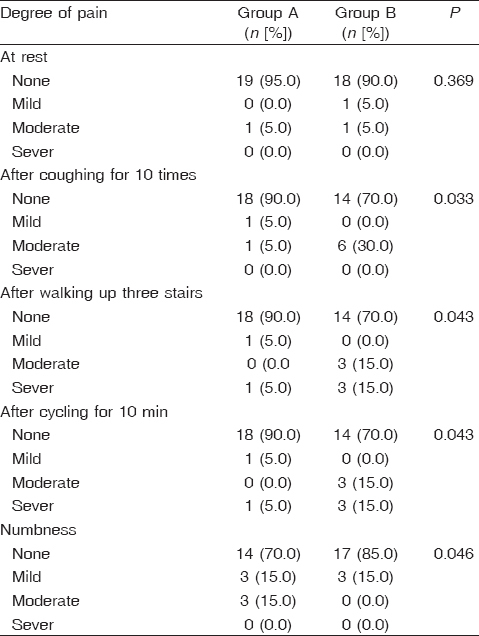 There were no statistically significant differences between the two groups with regard to postoperative pain after 1 month at rest (P = 0.369); however, after coughing 10 times, walking up three flights of stairs, and cycling for 10 min, there were statistically significant differences. Postoperative pain in group A was 5%, and in group B it was 30% (P < 0.05). Regarding sensory disturbance after 1 month postoperatively, numbness was 15% in group A (P = 0.046). Dittrick et al. reported a significantly lower incidence of chronic groin pain in patients who had elective neurectomy during open inguinal hernia repair when compared with the control group (3 vs. 2.5%) after 6 months. They did not test groin pain after various activities and groin numbness as in our study. Crea and Pata  randomized 97 consecutive patients into nerve division and preservation groups. They found reduced intensity of mild-to-moderate chronic groin pain after 6 months in the prophylactic nerve division group as compared with the preservation group. In a randomized study by Picchio et al. , who performed their study on 813 patients randomly allocated into two groups either with ilioinguinal nerve preservation or transection, only 593 patients made an office visit 1 year postoperatively They concluded that pain after open hernia repair with a polypropylene mesh was a relevant problem and was unaffected by elective division of the ilioinguinal nerve. In addition, the division of the ilioinguinal nerve was significantly related to sensory disturbances in the area of nerve distribution. In our study, there were no statistically significant differences between the two groups with regard to postoperative pain after 6 months at rest (P = 0.152); however, after coughing for 10 times, walking up three flights of stairs, and cycling for 10 min, there were statistically significant differences. Postoperative pain in group A was 5% and in group B 30% (P < 0.05). Regarding sensory disturbance after 6 months postoperatively, there were no statistically significant differences (P = 0.156). Despite controversies in management of the ilioinguinal nerve during hernioplasty, our results revealed that elective resection was better in terms of chronic postoperative pain. In addition, postoperative numbness was not such a frequent complaint that affected daily activities of patients when compared with chronic postoperative pain, especially because it was no longer present after 6 months. Our results support that elective resection of the ilioinguinal nerve is superior to its preservation. Chronic postoperative pain following the Lichtenstein tension-free hernioplasty was significantly less after resection of the ilioinguinal nerve. Furthermore, the procedure is not associated with additional morbidities in terms of local cutaneous neurosensory disturbances or deterioration in quality of life. Ilioinguinal neurectomy should be considered a routine surgical step during open-mesh hernioplasty. Kang SK, Burnett CA, Freund E, Sestito J. Hernia: is it a work-related condition? Am J Ind Med 1999; 36:638–44. Cheek CM, Black NA, Devlin HB. Groin hernia surgery: a systematic review. Ann R Coll Surg Engl 1998; 80 (Suppl 1):1–20. Reinpold WM, Nehls J, Eggert A. Nerve management and chronic pain after open inguinal hernia repair: a prospective two phase study. Ann Surg 2011; 254:163–166. Iqbal P, Shaikh NA. Postoperative complications of inguinal hernia repair. Med Channel 2006; 12:33–35. Amid PK. Causes, prevention, and surgical treatment of postherniorrhaphy neuropathic inguinodynia: triple neurectomy with proximal end implantation. Hernia 2004; 8:343–349. Maaliki H, Naja Z, Zeidan A. Repeated ilioinguinal block using a catheter technique for pain relief in inguinal neuralgia. Pain Pract 2008; 8:144–146. Kim DH, Murovic JA, Tiel RL, Kline DG. Surgical management of 33 ilioinguinal and iliohypogastric neuralgias at Louisiana State University Health Sciences Center. Neurosurgery 2005; 56:1013-1020. Malekpour F, Mirhashemi SH, Hajinasrolah E, Salehi N, Khoshkar A, Kolahi AA. Ilioinguinal nerve excision in open mesh repair of inguinal hernia-results of a randomized clinical trial: simple solution for a difficult problem? Am J Surg 2008; 195:735–40. Nyhus LM, Condon RE, Harkins HN. Clinical experiences with preperitoneal hernia repair for all types of hernia of the groin. Am J Surg 1960; 100:234–244. Mui WL, Ng CS, Fung TM, Cheung FK, Wong CM, Ma TH, et al. Prophylactic ilioinguinal neurectomy in open inguinal hernia repair: a double-blind randomized controlled trial. Ann Surg 2006; 244:27–33. Zanghi G, Di Stefano G, Arena M, Di Dio D, Basile F. Iliohypogastric neurectomy in the prevention of postoperative pain following inguinal hernioplasty. Il Giornale di chirurgia. 2012; 33:172-4. Nienhuijs S, Staal E, Strobbe L, Rosman C, Groenewoud H, Bleichrodt R. Chronic pain after mesh repair of inguinal hernia: a systematic review. Am J Surg 2007; 194:394–400. Kahn AM, Hamlin JA, Thompson JE. The etiology of the adult indirect inguinal hernia: revisited. Am Surg 1997; 63:967–969. Bawa AS, Batra RK, Singh R. Management of inguinal hernia with benign prostatic hyperplasia: simultaneous inguinal hernioplasty with transurethral resection of prostate. Int Urol Nephrol 2003; 35:503–506. Bittner R, Sauerland S, Schmedt CG. Comparison of endoscopic techniques vs Shouldice and other open non-mesh techniques for inguinal hernia repair: a meta-analysis of randomized controlled trials. Surg Endosc 2005; 19:605–615. Schmedt CG, Sauerland S, Bittner R. Comparison of endoscopic procedures vs Lichtenstein and other open mesh techniques for inguinal hernia repair: a meta-analysis of randomized controlled trials. Surg Endosc 2005; 19:188–199. Nordin P, Hernell H, Unosson M, Gunnarsson U, Nilsson E. Type of anaesthesia and patient acceptance in groin hernia repair: a multicentre randomised trial. Hernia 2004; 8:220–225. McCormack K, Scott NW, Go PM, Ross S, Grant AM EU Hernia Trialists Collaboration. Laparoscopic techniques versus open techniques for inguinal hernia repair. Cochrane Database Syst Rev 2003:CD001785. Simons MP, Bay-Nielsen M, Bouillot JL, Campanelli G, Conze J, De Lange D et al. European Hernia Society guidelines on the treatment of inguinal hernia in adult patients. Hernia 2009; 13:343–403. Ravichandran D, Kalambe BG, Pain JA. Pilot randomized controlled study of preservation or division of ilioinguinal nerve in open mesh repair of inguinal hernia. Br J Surg 2000; 87:1166–1167. Dittrick GW, Ridl K, Kuhn JA, McCarty TM. Routine ilioinguinal nerve excision in inguinal hernia repairs. Am J Surg 2004; 188:736–40. Crea N, Pata G. Effects of prophylactic ilioinguinal nerve excision in mesh groin hernia repair: short and long-term follow-up of a randomized clinical trial. Am Surg 2010; 76:1275–1281. Picchio M, Palimento D, Attanasio U, Matarazzo PF, Bambini C, Caliendo A. Randomized controlled trial of preservation or elective division of ilioinguinal nerve on open inguinal hernia repair with polypropylene mesh. Arch Surg 2004; 139:755–8; discussion 759.